1 and 2 : Cournil tractors still in service in August 2006 in Cantal, France. Pict J M Maclou. 1 and 2 : Cournil tractors still in service in August 2006 in Cantal. Pict J M M.
3 : Firefighter's Auverland A3 in Var, France. 4 : UMM operating in Aurillac in August 2006. 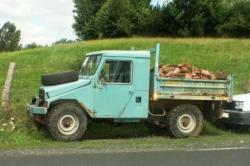 Pict J M M.
6 : In August 2006 in Cantal. Pict J M M.
7 : With an hydraulic shovel some of which were used by the Funeral Parlor around 1977. 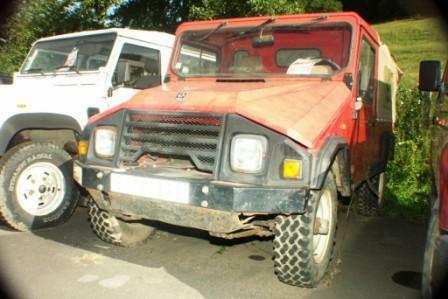 8 : 4x4 trial Prototype ADR built by Alain Cournil for Daniel Roche in 1983. This articulated vehicle had excellent crossing capabilities but a tubular aluminum alloy chassis too brittle. Suspensions were added to avoid turbulences caused by the rocky climbs. Pict from '4x4 Magazine' N° 28, 1983. 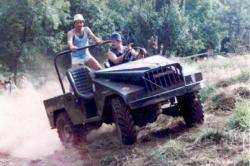 9 : A long Cournil at 4x4 trial competition of Jou-sous-Monjou in Cantal, August 15, 1987. Pict J M M.
10 : Nice restoration. Photo taken in Aurillac in August 2006. Pict J M M.
Auvergne (France) is a beautiful country. Often called 'The Green Country', this average mountainous region is the birthplace of the only civil 4x4 of French construction. 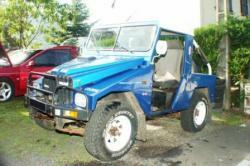 True 4x4 instead of 4x2 evolution as Sinpar or Dangel ! 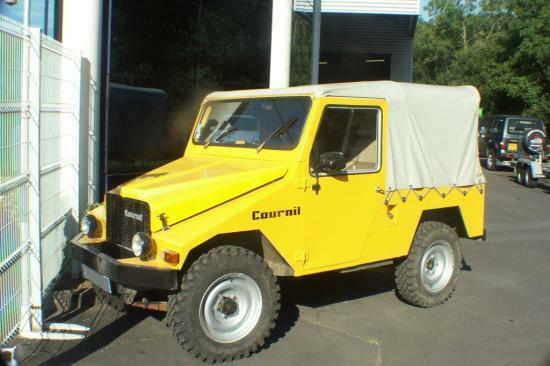 Even today, his distant descendant, the so different A3 Auverland, is still the only authentic French 4x4 but now reserved for military markets. The Portuguese UMM is the most like descendant of the original but now made only on request. At the end of the World War II, farmers at the head of small livestock farms and mixed farming, were immediately applicants of 4x4 vehicles and buyers of many Jeeps in the American surplus. The conventional agricultural material, rather large, specialized and expensive proved poorly adapted to local market. There were no tractors small enough with 4 wheel drive and low center of gravity for moving on the slopes. They needed a road-field vehicle. 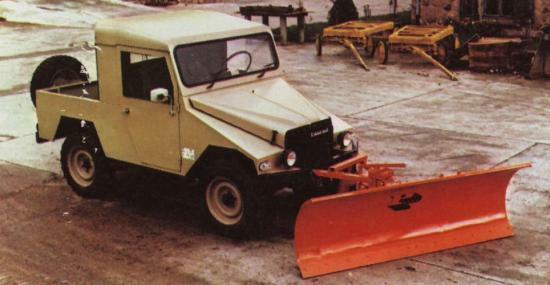 Bernard Cournil in his garage of Aurillac, found the answer by changing some Jeep to fit the demand of farmers : a flat floor (for milk cans) and a rear opening, a PTO, an hydraulic lift, adaptable plow, a cutter bar and even after an auger, snow plow blade, an hydraulic excavator and a very well designed trailer. Many patents were filed. This development took several years. The modified Jeep became an agricultural machine but still consuming fuel. A diesel Hotchkiss was fitted with an adapted clutch cover and transfer box specially made : a batch of 170 Jeeps Hotchkiss JH (CJ3-B) such equipped left off assembly. In 1960 a new ultra-reinforced frame was mounted and in 1961, the so characteristic body in folded sheet of 2 mm (almost a shield) that we all know appears and at the same time the motor position is rearward for better weight distribution. The hood and plunge fenders facilitated use in the steep trails : "we see where we put the wheels". Presented to the mines, it was registered under the name "Tracteur Cournil" Type JA1, developed 26 horses and was driven without a license. Bernard Cournil created tools needed by farmers. They brought not only the working tool but also the car to move faster (50 km/h) than real agricultural tractors (25 km / h at the time), the whole for an acceptable price. Jeep axles (Dana) are the only original parts except sometimes some foreign engines. In 1964 a self-locking differential axle was proposed for the first time in France as an option but the ultra-renforceid suspension allowed low crossing angle of axels and it was common that a Cournil remained in place between two diagonal bumps even with a limited slip differential. The Hygiene Department, Police and Customs choose Cournil. 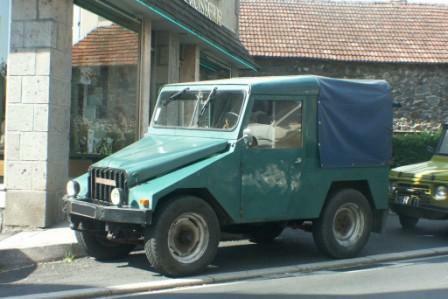 In 1964, a Leyland engine replaced the Hotchkiss and many others will follow, Peugeot, Renault, Ricardo, Indenor, Saviem. 1200 Cournil and 160 trailers were produced during the 60s on 5 mounting positions with fifty people in the garage of the Avenue of Prades in Aurillac. The company was a real success. They see it everywhere in the Massif Central and after 1965 in the Basque Country. Competition from conventional 4x4 agricultural tractors newly proposed, small Swiss or Austrians tractors specially for mountains Aebi type , rising of living standards and the extension of car park and small second hand trucks and also the lack of evolution of the product marked the beginning of a long decline from the early 70s. From 1971 to 1977, Alain Cournil, the son of Bernard, made 53 tractors. End of 1977, it seems that the 4x4 had the wind in their sails to a fresh start but there were competition with the Toyota Land Cruiser BJ and the Land-Rover 88. A Toyota very well equipped at that time was 120 000 F and a robust but brief Cournil, 130 000 F.
In 1977 Gevarm Gevelot group took over the company and manufacturing was transferred to Saint Germain Laval. 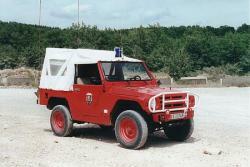 The UMM company also took up the torch in Portugal with the prohibition of sell 4x4 in France. The contract will not be met. Cournil had been taken over by the SIMI group of Belin from 1980 to 1982 and 560 vehicles were produced until 1984, mainly for government : EDF, Police, Equipment, Water and Forestry. Tropic model released in 1982 for civilian market was a failure. Still in 1982, François Servanin, BMW dealer of Boulogne Billancourt, bought the plant and created brand Auverland that came out the A3 in 1986 and marked the end of the famous hood of Cournil. The A3, entirely new vehicle was also sold to government and military markets. In civilian life, this car was distinguished by its numerous awards in trial 4x4 competition earned thanks to its long travel suspension. 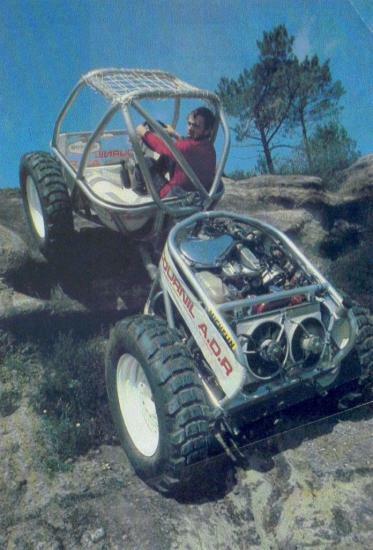 In 1989, Auverland acquired 4x4 manufacturer Sovamag witch produced 4x4 a little bigger, like Dodge. Peugeot sold Panhard to Auverland in 2005. Auverland took the name 'Panhard General Defense' and produced for a growth market many vehicles under 10 tons for the Army. Both sites Marolles-en-Hurepoix and Saint-Germain-Laval include now approximately 300 employees and produces other small PVP (Petit Véhicule Protégé). The Cournil epic was an important step in the mechanization of France. Today, Alain Cournil sells 4x4 Mitsubushi for twenty years in a new garage to Aurillac. He always repairs and restores old Cournil, Auverland and UMM yet many. The concentrations of these 4x4 are longstanding, often with his participation, and others will occur. Cournil tractors, thanks to their robustness and their tireless worker profile, became a legend here.